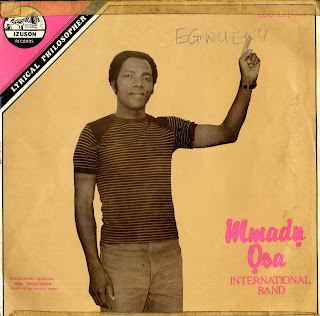 For the next song on the highlife turntable I have selected a track by the Mmadu Osa International band titled Ndu Osa. Led by Ikechukwu Izuegbu (alias the spokesman), he was a "lyrical philosopher" credited with "speaking the minds of many" on this Izuson label release circa 1985. I do not know much about Ikechukwu, but he appears to have spent several years apart from his family living in places like Ibadan, Kano, Lagos and Makurdi while they stayed in Ogwashi. This LP appears to be a dedication to his family and a thanks to God as it was released 1 year after they were reunited. This is a deeply spiritual band. The songs are described as commentaries and they reflect on the strength that one can gain by being faithful and loyal to a family, a people and a God. The words Mmadu Osa translate roughly into the phrase: Let goodness exist God. The song I have selected is Ndu Osa and translates into the phrase: Life God. Its a wonderful song that runs over 18 minutes and includes Ikechukwu's haunting vocals backed by a first rate band. Check out the way the horns follows and leads the vocalist through the song and the super conga and drum breaks. There is also a great guitar solo around the 15.30 minute mark. One of my desert island tracks. I hope you like it.